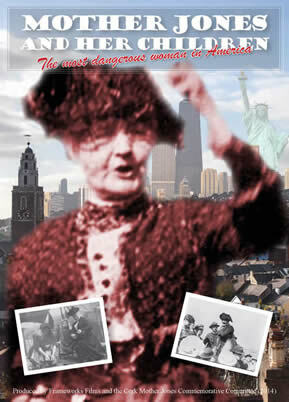 Mother Jones And Her Children is a 52 minute long documentary which outlines the extraordinary life and activities of the most famous Cork woman in America. Produced by Emma Bowell and Eddie Noonan of Cork based Frameworks Films (www.frameworksfilms.com) in cooperation with the Cork Mother Jones Committee. Highly recommended. DVDs (€10 each) are available from Jim Nolan at 22/23 Shandon Street, Cork. DVDs incl.package and postage within Ireland are €12 each. Package and postage to UK, Europe or USA €14 each. For bulk purchases, contact Jim on 086 1651356. Send postal order or euro draft or euro cheque payable to Cork Mother Jones Committee to above address. You can view a short (2 minute) excerpt from the film below. Mother Jones clip from Eddie Noonan on Vimeo.